Democrat Conor Lamb clung to a tiny lead late Tuesday night over Republican Rick Saccone in Pennsylvania's 18th congressional district special election, but no winner has been called yet. With more than 99 percent of precincts reporting, Lamb (111,875) led Saccone (111,028) by just 847 votes. There were more than 3,000 absentee ballots still to be counted at the publication of this report. BREAKING: AP is not declaring a winner in Tuesday's special election for Pennsylvania's 18th congressional district because the race between Democrat Conor Lamb and Republican Rick Saccone is too close to call. President Donald Trump won the West Pennsylvania district by nearly 20 points over Hillary Clinton in 2016, leading Democrats to cheer the close result Tuesday as more proof of a potential wave in November. Trump campaigned for Saccone on Saturday night, and Donald Trump Jr. and Saccone visited a candy factory in the district Monday that created jobs in the wake of the Trump-signed tax cuts, which Lamb opposed. 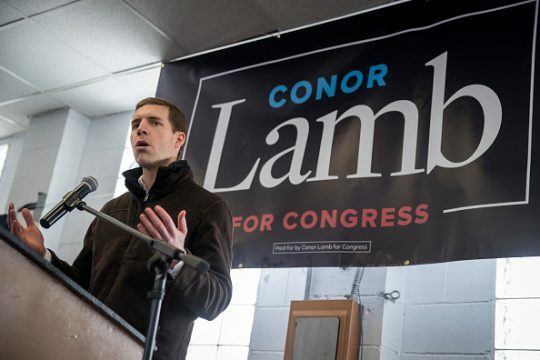 Lamb has bucked the national Democrats on issues like supporting gun rights and announcing his opposition to House Minority Leader Nancy Pelosi (D., Calif.). He also said he supported Trump's recent tariff announcement. This entry was posted in Politics and tagged Conor Lamb, Donald Trump, Donald Trump Jr.. Bookmark the permalink.